Franz Liszt wrote relatively little chamber music in his long and illustrious career. The Duo Sonata is a tribute to Chopin, drawing on one of his famous Mazurkas as well as other Polish themes. 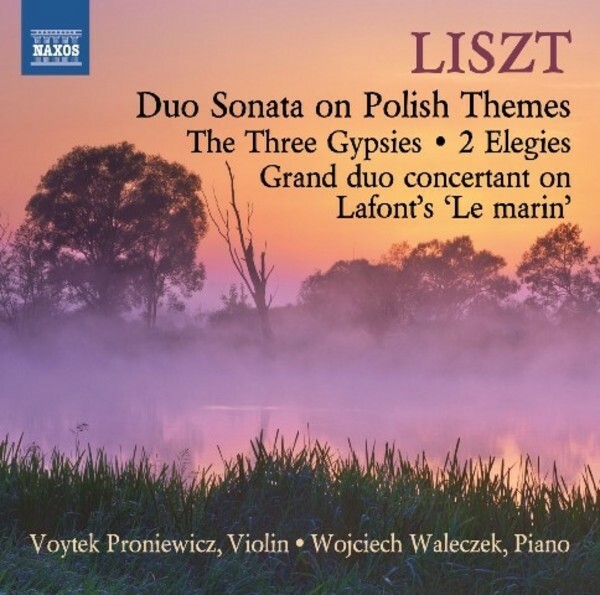 The gracefully charming Epithalamium was Liszt�s wedding present to the great violinist Eduard Rem�nyi, for whom the gipsy style of Die drei Zigeuner was also intended. The two lyrical Elegies commemorate the passing of members of Liszt�s circle, while the demandingly virtuoso variations of the Grand Duo concertant make no concessions to either player. Best known for his remarkable piano, vocal and orchestral works, Liszt�s chamber music is relatively unfamiliar but is highly entertaining, tending to avoid the heavier romanticism of his more extensive solo pieces. This sparkling new recording brings together two star performers - award-winning violinist Voytek Proniewicz who has already appeared on one of our 'Pupils of Chopin' albums (8572460), and winner of the 1997 Ferenc Liszt National Piano Competition in Wrocław, Wojciech Waleczek, who is recognized internationally as a pianist with uncompromisingly high standards in performance.